So far MPEG has developed, is completing or is planning to develop 22 standards for a total of 201 specifications. For those not in MPEG, and even for some active in MPEG, there is natural question: what is the purpose of all these standards? Assuming that the answer to this question is given, a second one pops up: is there a logic in all these MPEG standards? I will leave it to the reader to decide where to place their decision on this continuum of possibilities after reading this article that will only deal with the first 5 standards. The goal of MPEG-1 was to leverage the manufacturing power of the Consumer Electronics (CE) industry to develop the basic audio and video compression technology for an application that was considered particularly attractive when MPEG was established (1988), namely interactive audio and video on CD-ROM. This was the logic of the telco industry who thought that their future would be “real time audio-visual communication” but did not have a friendly industry to ask to develop the terminal equipment. The bitrate of 1.5 Mbit/s mentioned in the official title of MPEG-1 Coding of moving pictures and associated audio at up to about 1,5 Mbit/s was an excellent common point for the telecom industry with their ADSL technology whose first generation targeted that bitrate and for the CE industry whose Compact Disc had a throughput of 1.44 Mbit/s (1.2 for the CD-ROM). With that bitrate, compression technology of the late 1980’s could only deal with a rather low, but still acceptable resolution (1/2 the horizontal and 1/2 the vertical resolution obtained by subsampling every other field, so that the input video is progressive), Considering that audio had to be impeccable (that is what humans want), at least 200 kbit/s had to be assigned to audio. Part 5 – Software simulation (link). MPEG-2 was a more complex beast to deal with. A digitised TV channel can yield 20-24 Mbit/s, depending on the delivery system (terrestrial/satellite broadcasting or cable TV). Digital stereo audio can take 0.2 Mbit/s and standard resolution 4 Mbit/s (say a little less with more compression). Audio could be multichannel (say, 5.1) and hopefully consume less bitrate for a total bitrate of a TV program of 4 Mbit/s. Hence the bandwidth taken by an analogue TV program can be used for 5-6 digital TV programs. The fact that digital TV programs part of a multiplex may come from independent sources and that digital channels in the real world are subject to errors force the design of an entirely different Systems layer for MPEG-2. The fact that users need to access other data sent in a carousel, that in an interactive scenario (with a return channel) there is a need for session management and that a user may interact with a server forced MPEG to add a new stream for user-to-network and user-to-user protocols. In conclusion the MPEG-2 model is a natural extension of the MPEG-1 model (superficially, the DSM-CC line, but the impact is more pervasive). 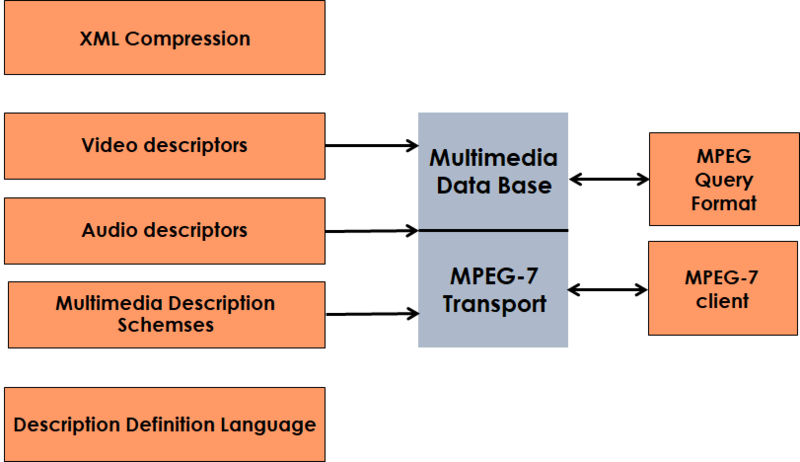 The official title of MPEG-2 is Generic coding of moving pictures and associated audio information. It was originally intended for coding of standard definition television (MPEG-3 was expected to deal with coding of High Definition Television). As the work progressed, however, it became clear that a single format for both standard and high definition was not only desirable but possible. Therefore the MPEG-3 project never took off. The standard is not specific of a video resolution (this was already the case for MPEG-1 Video) but rationalises the notion of profiles, i.e. assemblies of coding tools and levels a notion that applies to, say, resolution, bitrate etc. Profiles and levels have subsequently adopted in most MPEG standardisation areas. Part 7 – Advanced Audio Coding (AAC) specifies a non backward compatible multichannel audio coding algorithm. This was done because backward compatibility imposes too big a penalty for some applications, e.g. those that do not need backward compatibility (link), the first time MPEG was forced to develop two standards for apparently the same applications. MPEG-4 had the ambition of bringing interactive 3D spaces to every home. Media objects such as audio, video, 2D graphics were an enticing notion in the mid-1990’s. The WWW had shown that it was possible to implement interactivity inexpensively and the extension to media interactivity looked like it would be the next step. Hence the official title of MPEG-4 Coding of audio-visual objects. This vision did not become true and one could say that even today it is not entirely clear what is interactivity and what is the interactive media experience a user is seeking, assuming that just one exists. Is this a signal that MPEG-4 was a failure? Yes, it was a failure, and so what? MPEG operates like a company. Its “audio-visual objects” product looked like a great idea, but the market thought differently. No, it was a success, because 6 years after MPEG-2, MPEG-4 Visual yielded some 30% improvement in terms of compression. Yes, it was a failure because a patent pool dealt a fatal blow with their “content fee” (i.e. “you pay royalties by the amount of time you stream”). No it was a success because MPEG-4 has 34 parts, the largest number ever achieved by MPEG in a standard, that include some of the most foundational and successful standards such as the AAC audio coding format, the MP4 File Format, the Open Font Format and, of course the still ubiquitous Advanced Video Coding AVC video coding format whose success was not dictated so much by the 20% more compression that it delivers compared to MPEG-4 Visual (always nice to have), but to the industry-friendly licence released by a patent pool. Most important, the development of most MPEG standards is driven by a vision. Therefore, users have available a packaged solution, but they can also take the pieces that they need. Part 2 – Visual specifies the coded representation of visual information in the form of natural objects (video sequences of rectangular or arbitrarily shaped pictures) and synthetic visual objects (moving 2D meshes, animated 3D face and body models, and texture) (link). Part 33 – Internet Video Coding (IVC) specifies a video compression format (link). Parts 29, 31 and 33 are the results of 3 attempts made by MPEG to develop Option 1 Video Coding standards with a good performance. All did not reach the goal because ISO rules allow a company to make a patent declaration without specifying which is the patented technology that the declaring company alleges to be affected by a standard. The patented technologies could not be removed because MPEG did not have a clue about which were the allegedly infringing technologies. In the late 1990’s the industry had been captured by the vision of “500 hundred channels” and telcos thought they could offer interactive media services. With the then being deployed MPEG-1 and MPEG-2, and with MPEG-4 under development, MPEG expected that users would have zillions of media items. MPEG-7 started with the idea of providing a standard that would enable users to find the media content of their interest in a sea of media content. Definitely MPEG-7 deviates from the logic of the previous two standards and the technologies used reflect that because it provides formats for data (called metadata) extracted from multimedia content to facilitate searching in multimedia items. As shown in the figure, metadata can be classified as Descriptions (metadata extracted from the media items, especially audio and video) and Description Schemes (compositions of descriptions). The figure also shows two additional key MPEG-7 technologies. The first is the Description Definition Language (DDL) used to define new Descriptors and the second id XML Compression. With Descriptions and Description Schemes represented in verbose XML, it is clear that MPEG needed a technology to effectively compress XML. Part 1 – Systems has similar functions as the parts 1 of previous standards. In addition, it specifies a compression method for XML schemas used to represent MPEG-7 Descriptions and Description Schemes. Part 15 – Compact descriptors for video analysis specifies a format that can be used to analyse video clips (link). In the year 1999 MPEG understood that its technologies were having a disruptive impact on the media business. MPEG thought that the industry should not fend of a new threat with old repressive tools. The industry should convert the threat into an opportunity, but there were no standard tools to do that. MPEG-21 is the standard resulting from the effort by MPEG to create a framework that would facilitate electronic commerce of digital media. It is a suite of specifications for end-to-end multimedia creation, delivery and consumption that can be used to enable open media markets. This is represented in the figure below. The basic MPEG-21 element is the Digital Item, a structured digital object with a standard representation, identification and metadata, around which a number of specifications were developed. MPEG-21 also includes specifications of Rights and Contracts and basic technologies such as the file format. Part 21 – Media Contract Ontology specifies an ontology for media-related digital contracts (link). The standards from MPEG-1 to MPEG-21 contain 86 specifications covering the entire 30 years of MPEG activity. They should give a rough idea of how MPEG started from the vision of single standards for all industries belonging to what we can call today the “media industry” and has kept on adapting – without disowning – its vision. The original vision has been a seed that has grown – and continues to grow – into a tree. MPEG keeps track of the evolution of technologies to provide more efficient standards and to the needs of the industry with refurbished old and brand new standards.